Celebrating the Mexican party with our cetaceans! This month is an excellent moment to talk about an exceptional Mexican treasure, its marine fauna. Did you know that there are 39 species of cetaceans in Mexico? 8 of them are whales with beard and the other 31 are from the cetaceans with teeth. Get to know them! This is the world’s smallest cetacean and it’s Mexican! It is found only in the Gulf of California in northeastern Mexico. The water in this region is very turbid, it makes echolocation very important for the specie at the time of obtaining food and sailing. It lives in groups of 10 individuals. The adults measure up to 1.50 meters long, they weigh 46 kilos on average and their main food is fish and shellfish. Unfortunately, there are only about 60 of them today, which puts them in critical danger of extinction. It is all of our responsibility to maintain them alive. In contrast to the Vaquita, the Blue Whale is the world’s largest mammal; it is 30 meters long, its tail fin measures up to 6 meters and it weighs 190 tons on average. It feeds on zooplankton, krill is its main meal, which seeps through its 250 to 400 maxillary beards. The Blue Whales make migration journeys from the north to south and the Gulf of California, the North Pacific and Tropical Pacific in Mexico are where they breed, mainly during the winter and spring. This specie is now categorized in the Appendix I of the Convention on International Trade in Endangered Species of Wild Fauna and Flora (CITES), the highest category for endangered species, and it is under special protection in Mexico. The Killer Whale is the largest specie of the dolphin family, reaching 8 meters long and weighing 3 to 4 tons. That’s right, the Killer Whale is from the dolphin family! Their groups are formed of 40 individuals of different ages and genders. These large dolphins hunt in groups, and their diet consists of other marine mammals, turtles, seabirds and fish, including rajiformes. This specie has no natural predators. The Killer Whale is cosmopolitan, which means it can be found anywhere in the world, however it is most common for it to live in cold waters or high latitudes. In Mexico, the main sightings occur in the Pacific and in the Gulf of California, only very few have been registered in the Atlantic Ocean. 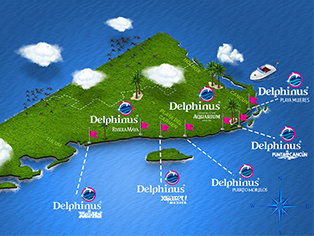 Swimming with dolphins is ideal to learn more about other members of the dolphin family, such as the Killer Whale, which is categorized in the Appendix II of CITES at an international level, and is enlisted under protection by the Mexican legislation. The Sperm Whale is the world’s largest cetacean with teeth (Odontoceti). It reaches up to 18 meters in length and weighs 58 tons on average. These cetaceans are gregarious, which means that they live in groups of over 50 individuals. They feed on cephalopods, especially giant squid. They have a special protection in their digestive system to avoid damage caused by the “ink” from the squids. Sperm whales migrate to the poles in spring and summer, and to tropical regions in autumn and winter. In Mexico, they are found in all of the oceans: North Pacific, Tropical Pacific, Gulf of California, Gulf of Mexico and the Caribbean Sea. Just like killer whales, sperm whales appear in the Appendix II of CITES and are specially protected by the Mexican legislation. There is not much information about this cetacean because all of it comes only from when they have been found stranded. It is believed that they live in deep waters and are very shy in the presence of boats and ships. The Gervais’ beaked whale measures 7.5 meters, weighs 1 to 2 tons, and its main meal is squid. It is found in the Atlantic and on the west coast, from New York to the Gulf of Mexico and the Caribbean. Although it is not protected in Mexico, it is considered a rare species, which is why its commercialization is controlled and it is included in the Appendix II of CITES (it includes species that are not particularly in danger of extinction). Now that you know more about these amazing cetaceans that live in our Mexican oceans, the idea is to create awareness about their importance for the balance of our marine ecosystem. We believe the best way to celebrate the Mexican month is by swimming with dolphins, where you can learn more about this marine species. Are you ready to meet this marine mammal?